Candied Quince is what I call my "secret weapon" when making spectacular desserts. Quinces are a lesser-known fall fruit that retains many “wild” characteristics. They're very astringent (and, it must be said, unpleasant) when eaten raw, so they must be cooked to be enjoyed. When raw, they look similar to a pear, with greenish-yellow skin and white flesh, but when cooked, their flesh turns a deep rose color and they have a sweet, spiced, floral flavor. Candied quince is so good, I often have to stop myself from eating it plain! It's best enjoyed on top of ice cream or ladled onto cake slices. It's also good on yogurt or granola for a snack. Peel the quinces and cut them into quarters. 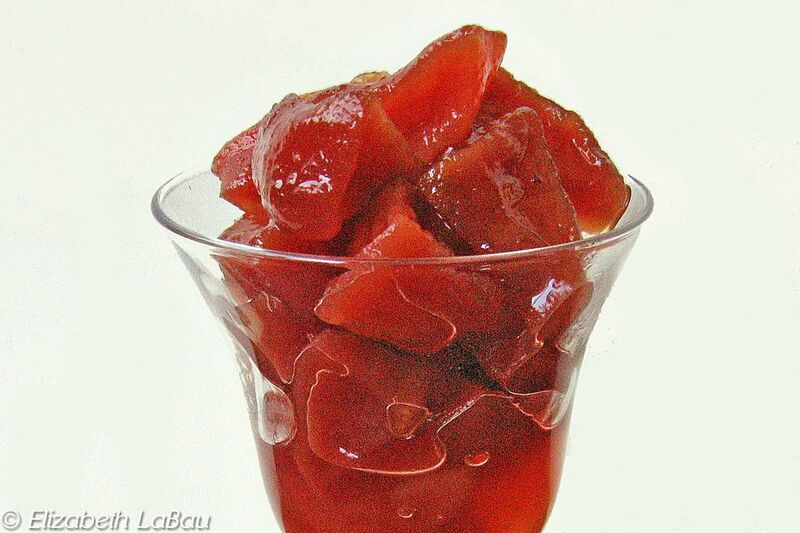 Remove the cores, and cut the quince sections into small cubes or thin slices. If you are eating them plain, I think the cubes are nice, but if you are using them in a pastry, the thin slices work better. Place the water and sugar in a medium saucepan over medium heat, and stir until the sugar dissolves. Add the quinces, the whole cloves, and the lemon juice, and turn the heat to low. Simmer the quinces over low heat in their sugar syrup for 1.5-2 hours, stirring occasionally to ensure they are evenly coated in syrup. During the cooking process the quinces will turn a vivid rose color, and the sugar water will reduce to a thick, syrupy liquid. Periodically test a quince slice to see if they’re done: they should be chewy and have almost a jelly candy texture. Overcooking will make their edges hard, so watch them closely near the end. If they don’t seem to be done and the syrup is looking very thick, add additional water to keep it from reducing too much. Once the quinces are done cooking, remove them from the heat and let them cool. Take out the whole cloves before eating. I love eating them plain, and they’re also great on top of ice cream, or as a pie or tart filling. Store Candied Quinces in their syrup in an airtight container in the refrigerator for up to a week. Click Here to View Apple Candy Recipes!